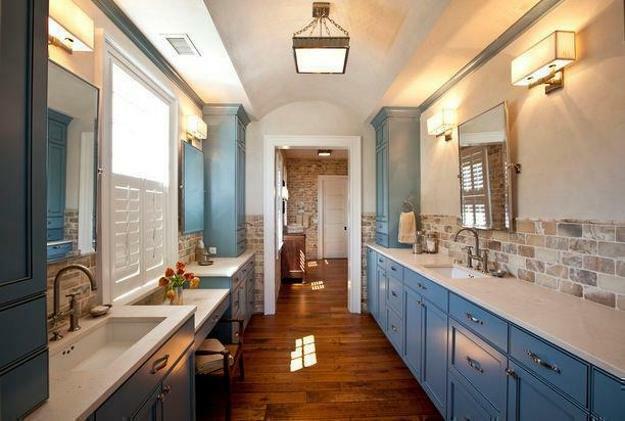 Blue hues are wonderful kitchen colors. Kitchen cabinets and shelves, kitchen island designs and wall tiles, dining furniture and decorative fabrics in blue color look cool, calming and fresh. 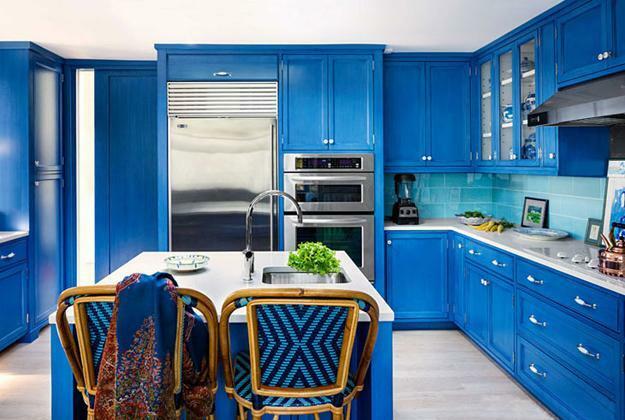 Blue colors make people eat less food, helping to loose weight, so blue color shades and tones can be strategically added to modern kitchen design and decorating color schemes to create beautiful and less stimulating appetite environment. 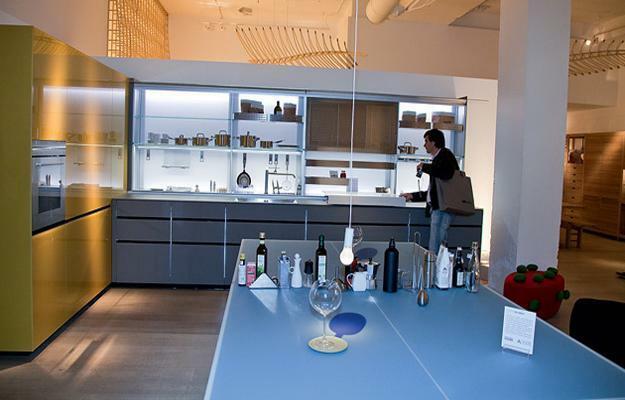 Modern interiors in blue colors can repress a hunger, and make people less likely to overeat. 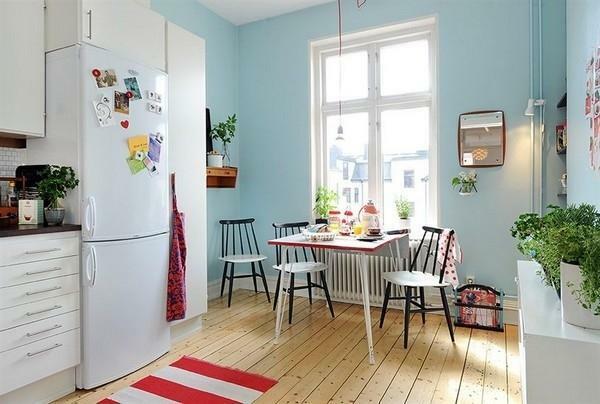 Blue kitchen design is calming and relaxing, but if you like warm colors your can blend wooden furniture with decorating fabrics or painted furniture, creating attractive, inviting and interesting modern kitchen design and decorating with blue colors. 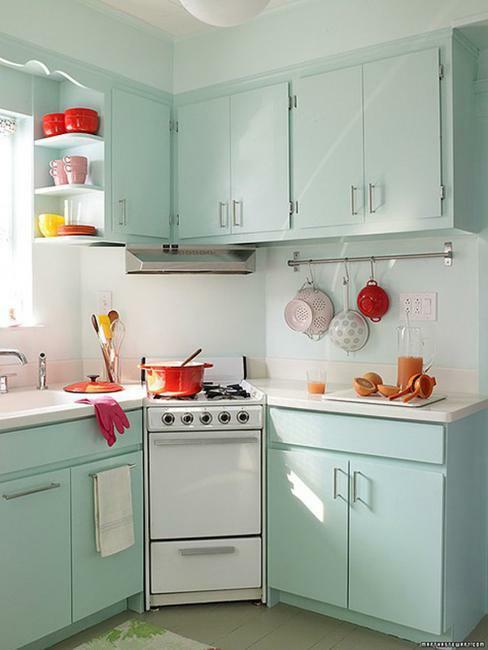 There are many stylish ways to add this color to your kitchen design and decor. 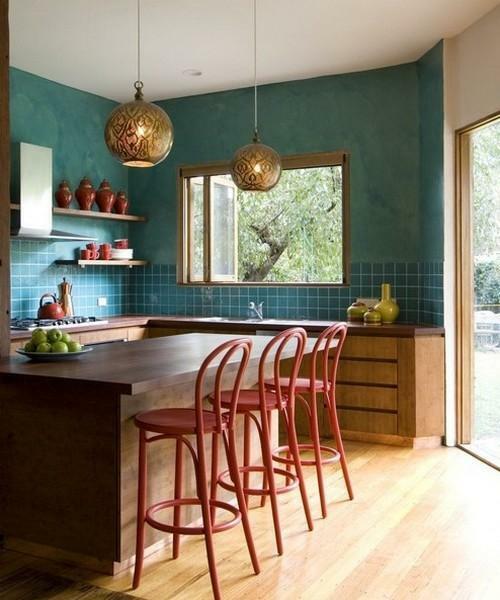 Painting kitchen cabinets or creating an accent wall with blue wallpaper balance modern kitchen design and allow to combine blue with your favorite warm decorating colors, such as red, orange, yellow, and golden colors. 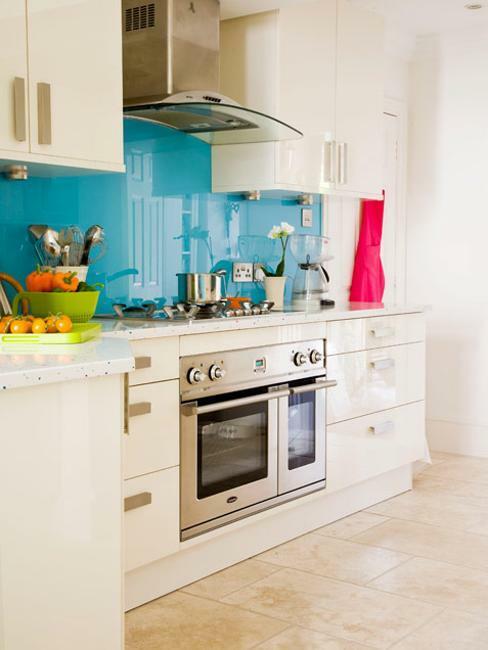 Brighter colors bring energy and create cheerful kitchen design and decor. Blending blue color with bright tones or brown colors of natural wood create warm and cozy, harmonious and pleasant modern kitchen design. 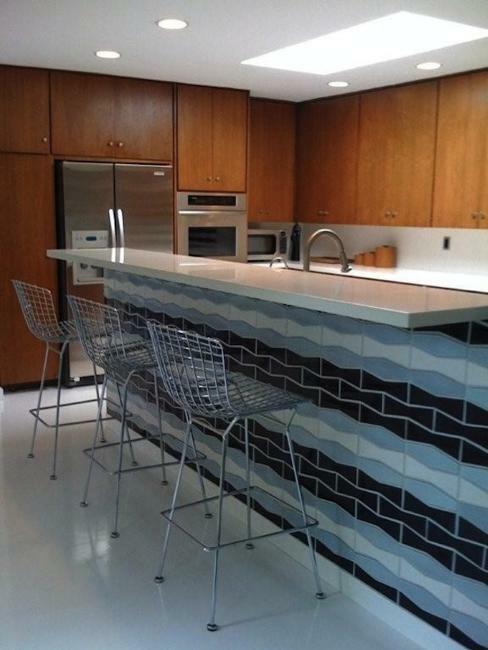 Blue color is the symbol of water, so in dark climates blue kitchens look especially cool and attractive. 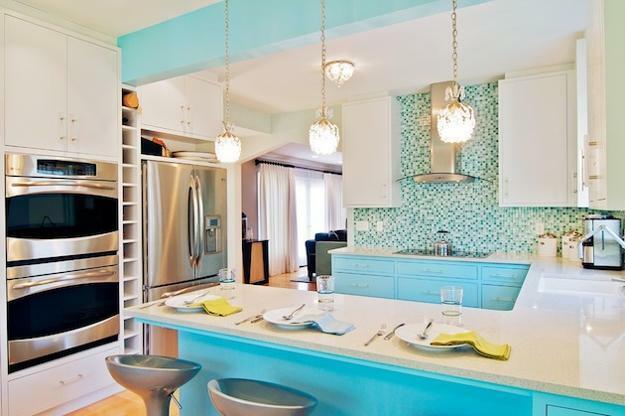 Inspired by blue ocean waves, gracious rivers and spectacular lakes, blue paint colors, blue wallpaper patterns, tile designs and decorating fabrics in blue colors are excellent for modern kitchen design. 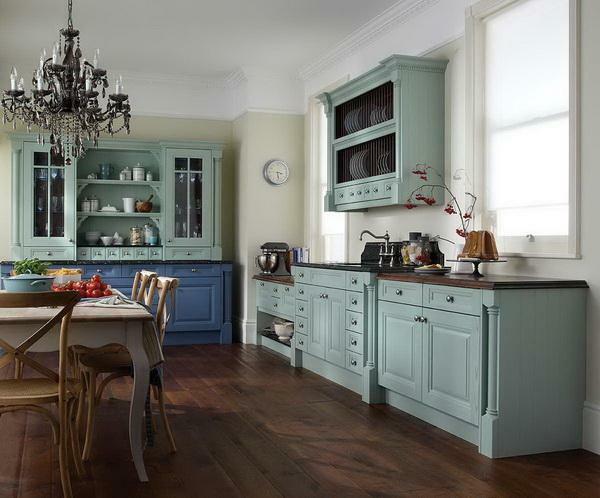 There are many shades of blue from the dark and rich noble blue color shades to pale blue and light sky blue tones to add to modern kitchen design and decor. Reminiscent of Mediterranean sea turquoise waves or mysterious dark blue night skies, rich blue colors are powerful and attractive, perfect for ethnic interior or unique kitchen design and decorating ideas. 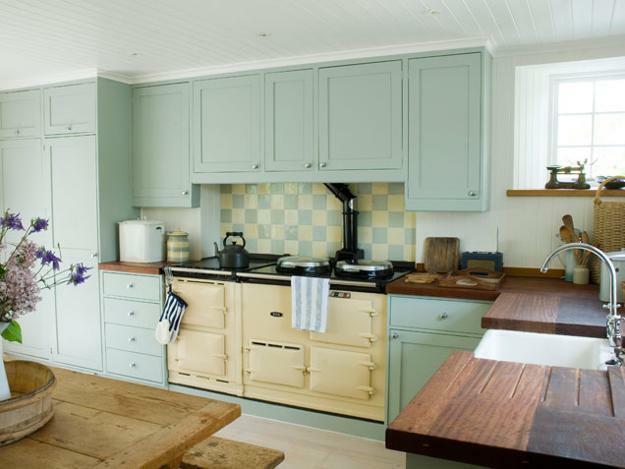 Light blue colors are great for classic kitchen designs that blend elegance and freshness, and give modern kitchens a calm look. Turquoise blue with white decorating ideas, light green or soft gray color tones look elegant and light, especially with wooden elements. 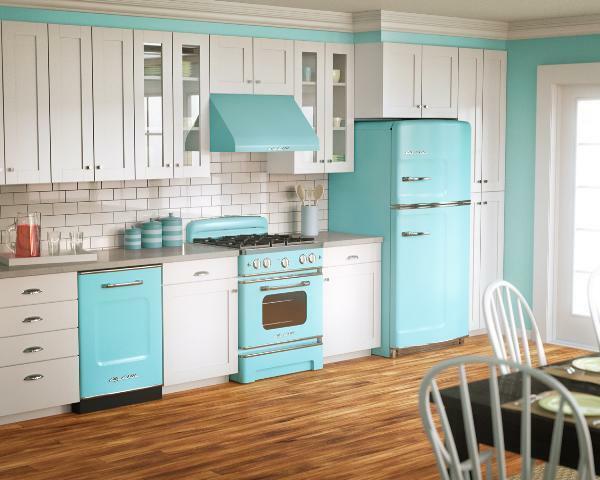 These kitchen colors are wonderful for classic and retro-modern kitchen designs. 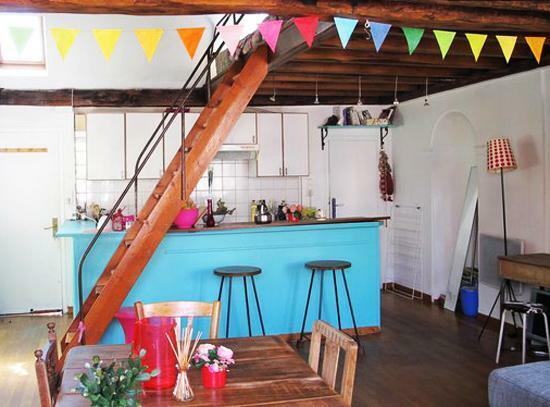 Pale blue tones can be combined with warm colors. 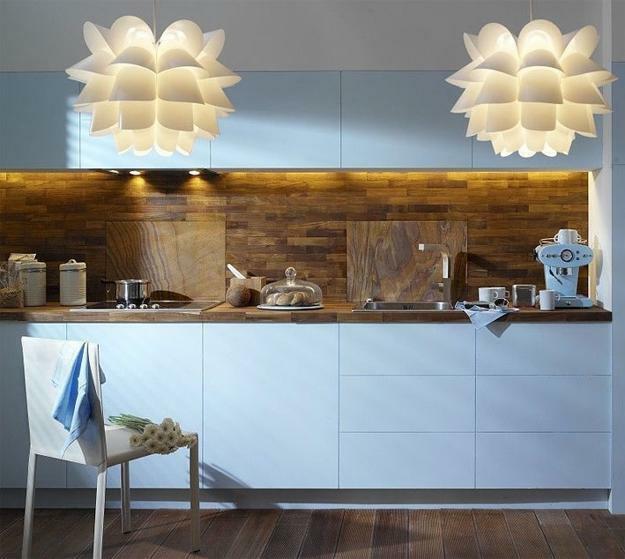 Red, orange and yellow or brown colors of natural wood work well with kitchen cabinets and island designs in light blue colors. 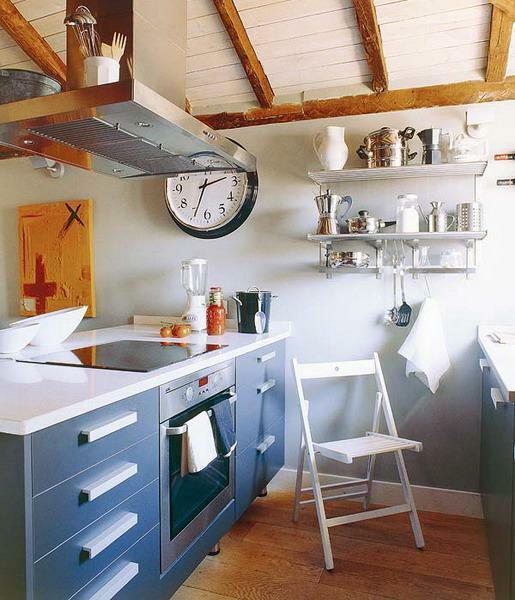 Salvaged wood and wooden architectural elements can warm up modern kitchen design and add unique character to interior decorating ideas. 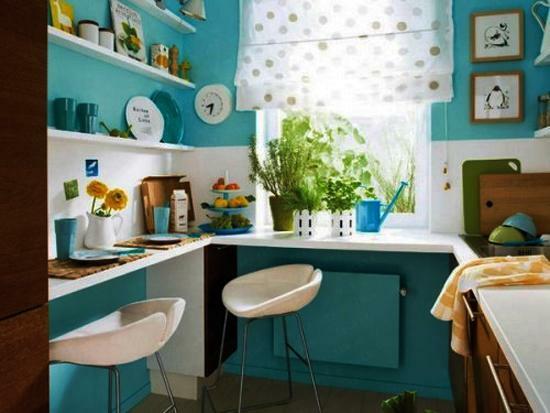 Green colors, turquoise blue and all pastel blues are excellent for contemporary kitchen design and decor. 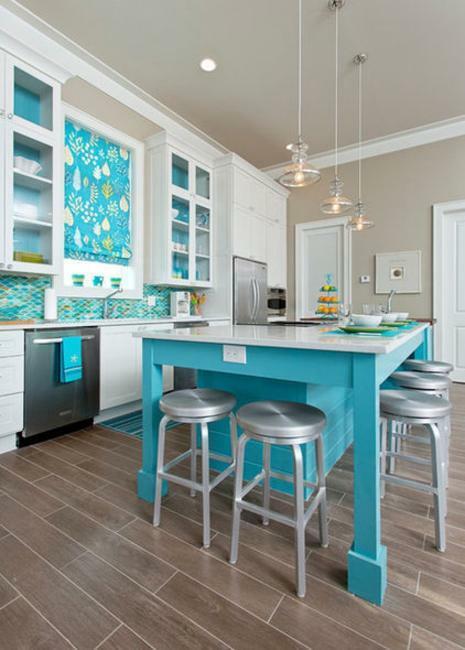 Mixing blue color tones with other colors allow to create fantastic color combinations for modern kitchens. Adding red and pink accents or purple color shades with warm colors can turn kitchen interiors into colorful and welcoming modern spaces. 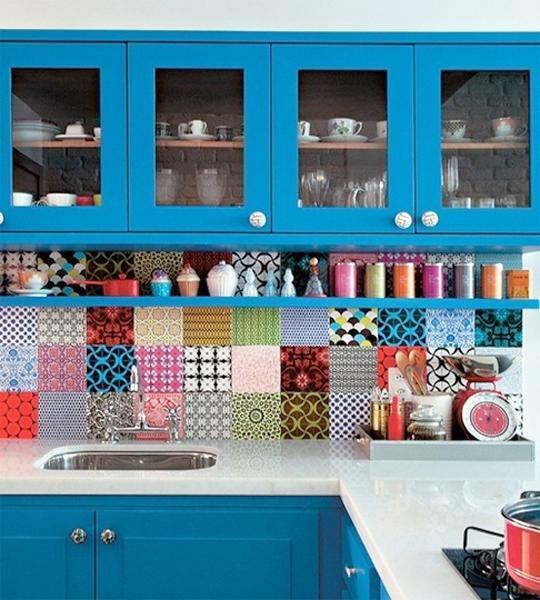 Modern backsplash designs, wall tiles, interior paint, wallpaper patterns, decorating fabrics and kitchenware in blue colors are great ways to add these cool and beautiful hues to modern kitchen design and decorating ideas. 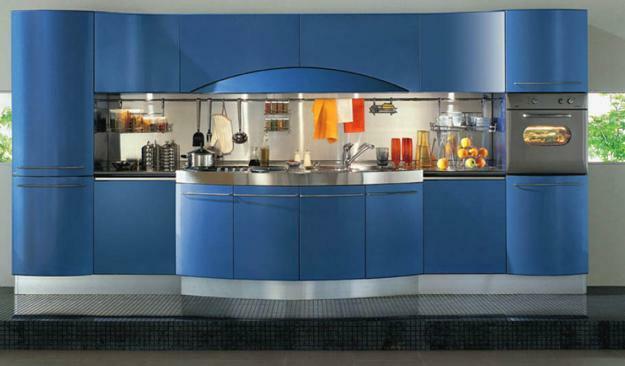 Blue color allows to create fantastic contrast and add personality to kitchen designs. Light blue can be combined with darker warm colors, and deep blue colors feel bright and fresh and inviting with white decorating and light warm colors. 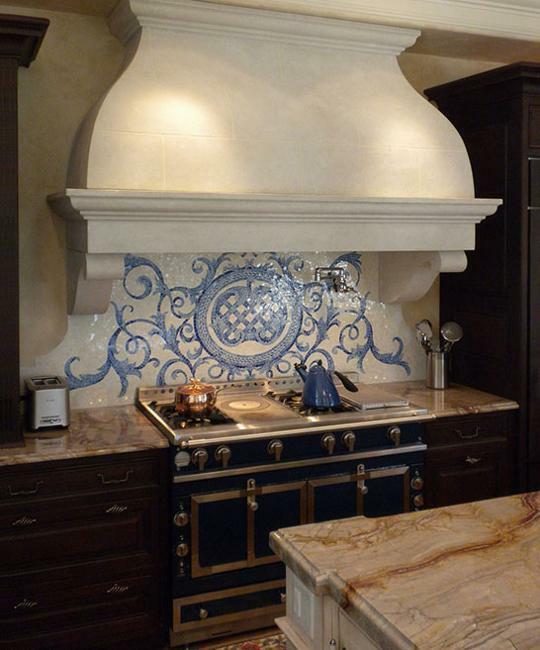 Kitchen cabinets or walls in light blue colors look harmonious and warm with yellow and red colors without creating the frosty look of white-light blue color schemes. 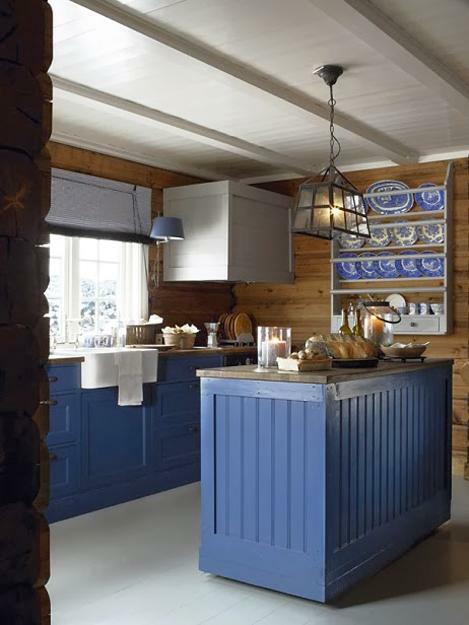 Blue color is perfect for wooden kitchens. 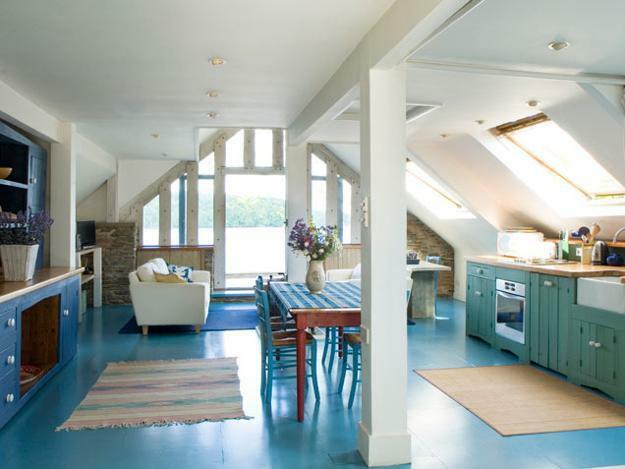 Using blue paint or contemporary finishes in blue color with wooden floors, ceiling beams, wall decor or dining furniture, create amazingly pleasant, stylish and original kitchen interiors. 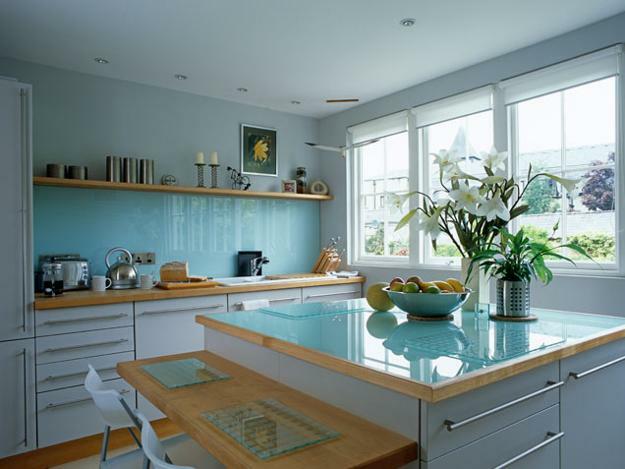 Blue surfaces, especially in light blue and turquoise blue color tones, add a calming and cooling feel to modern kitchen design and decor, by warm brown colors of natural wood balance and harmonize kitchen interiors filling them with inviting and cozy atmosphere.